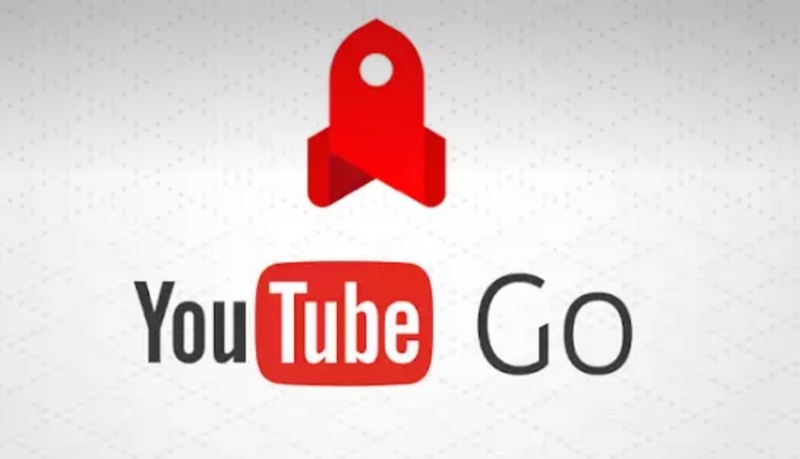 We all know about YouTube which was launched as a video sharing website in 2005. In 2006 Google bought this site and from that time Google is doing all major changes in it. It is a website on which we can stream videos on our device with a successful network connection. We can also start our YouTube channel on it and upload videos on our channel. 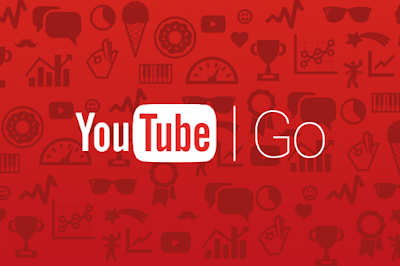 There are various channels on YouTube related to Technology, cookery, cricket, Bollywood, Comedy, sports and many more. YouTube gained very much popularity as we can see any type of video on this by just sitting at one place. So it has become a very important component in our life. Persons all around the world can see these videos and increase our views. They can also react to our videos by commenting on it or by liking/disliking it. There is also an option of Adsense on YouTube, in which we can enable this on our channel and can earn money on the basis of our views. In exchange YouTube shows some advertisements on our channel. 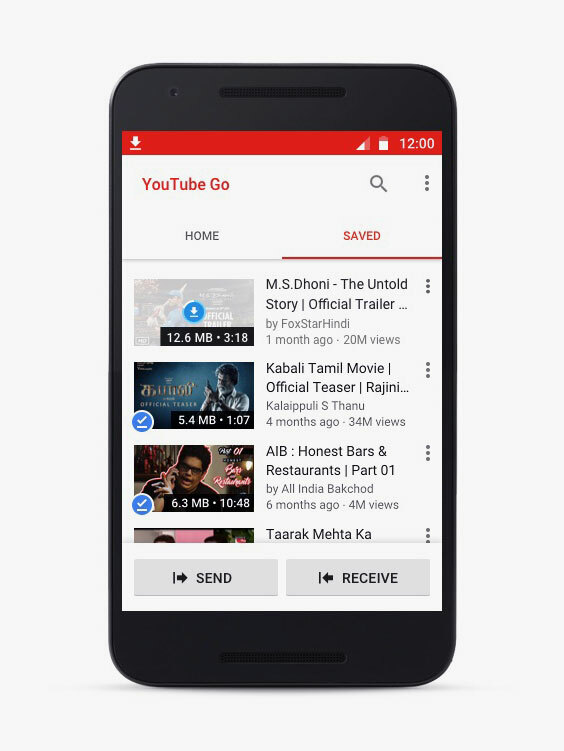 Later on, the feature of YouTube come to smartphones in the form of app. From that time there is a single YouTube app available on which we can watch videos. But this app get updates from time to time. Later on a new feature came to this too in which we can download these videos and can stream them without an internet connection. 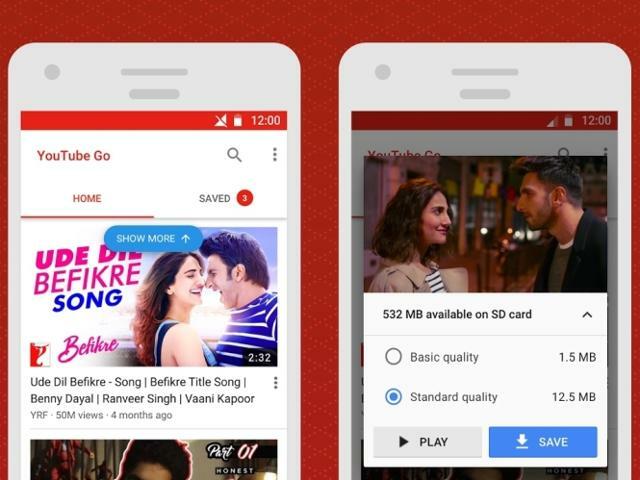 But these videos are not available on our device for a long time, these videos need to be updated after some time which requires an internet connection. Also this YouTube app requires a fast internet connection for streaming videos. So watching these videos at a low connection is not possible. In India some people are still using 2G network on their smartphones and also the internet speeds in India are not as Great as in some foreign countries. Keeping in mind all these things YouTube introduced a new app named YouTube Go for India which according to the company can stream videos with slow internet connection. 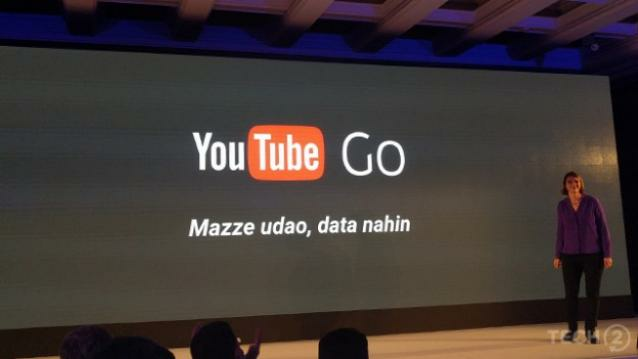 Last week YouTube released beta version of this app in India. So today I will tell you about my experience with this app. This app has some different logo other than regular YouTube app. 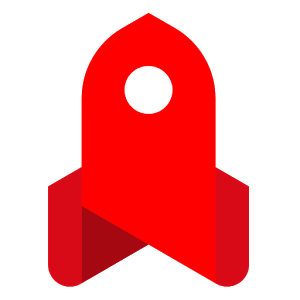 The logo of the app is in the shape of of a rocket having red color. So this logo looks good. When we open the app firstly it ask for language in which we want to use the app. There are many languages available such as English, Hindi, Bengali, Gujarati, Kannada etc. Than it requests to add our phone number to the app so that it can link our phone number. Than it asks to verify the mobile number which we provide. After clicking verify now it sends a verification code to our smartphone and verifies our phone number. After all this procedure the original app opens up, it shows us some popular videos to us in the home window. On right hand side at the top it has search option in which we can search any video by typing it's name. As soon as we click on a video a window opens up showing slight shots which are in between the videos. But these shots are not very clear, so it is a little bit difficult to judge the video before playing it. Below this it shows our phone's available storage. It also shows two video qualities named basic quality and standard quality, we can choose whatever we want to choose. Below this it shows option to play the video or to save it. We can save or play the videos in both the qualities that are basic quality and standard quality. The video quality of basic one is really poor but the standard one is having really good quality, it looks very good on the phone. That's why the basic one has small storage size while the standard one has larger size. The next task is to save the video. We can simply save the video by clicking on save button. For saving the video we require an internet connection. After downloading\saving the video on our phone we can simply see the video without any internet connection. This video doesn't get saved in our phone as a normal video but it is saved in some type of file. It uses the same concept as it is used in YouTube offline mode. So simply we can watch these videos only in YouTube Go app. We can also share these videos with our friends without any internet connection. We can send these videos to our friends and can receive their videos with this app in very less time. 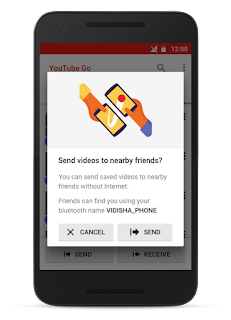 In sending videos it uses the same concept as those of Share it and Xender. So it is very interesting. So this feature is a very good feature of this app. Also there is settings option on right side top corner of the app. In settings it shows our registered phone number, our Gmail id and install id. Also there is an option of update app where we can update this app when it is available. 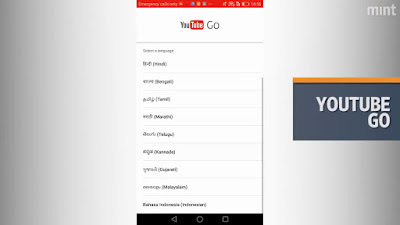 Also there is option of changing language of the app over here. We can choose any language as I mentioned earlier. Also it shows available storage in our mobile here. 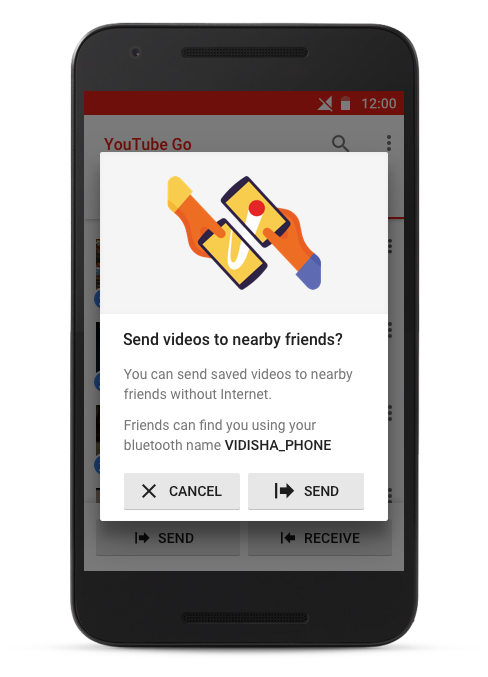 There is option of getting notifications of daily videos. We can also see our app history here what we have watched on YouTube till now.